The Grunwick dispute changed the rules of the game. 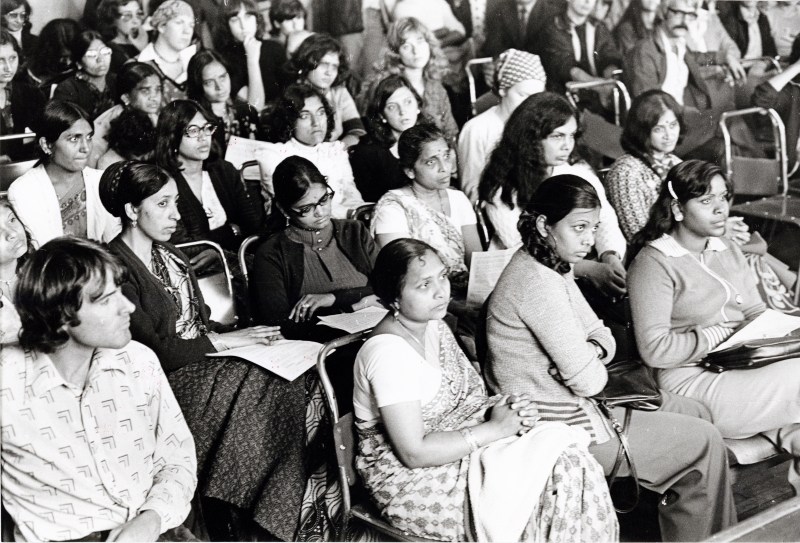 It changed the way that the unions thought about race, about their own core values, and about the best way to organise among the new immigrant communities coming to Britain in the 1970s. It fundamentally challenged the way unions viewed the law and it raised big questions about the Labour Movement’s will to win. However, it also warned of the coming storm. The ruthlessness and contempt shown by the forces arrayed against the strikers: their use of private ad hoc companies to break the dispute wide open; the appearance of shadowy Hard Right Wing groups to advise the employers and provide for them seemingly unlimited war chests; and – for perhaps the first time – the savagely political and partial use of policing to target pickets; were all features of the Grunwick strike. A decade later, these features would come to dominate industrial relations, when Margaret Thatcher and Keith Joseph – who had cheered on the management at Grunwick, from the sidelines – came to dominate the agenda of central government. The Grunwick dispute was important, too, for another reason. At the beginning it wasn’t a strike about wages – it was about something much more important than that. It was about dignity at work. And, as any trade unionist will tell you, dignity and rights in the workplace, and pride at work, are far more important than any amount of money. Conditions at Grunwick were appalling. Management was bullying and arrogant. Overtime was imposed at short or no notice; often stretching the working day out until 10 o’ clock at night. In the swelteringly hot summer of 1976 there were no fans or air conditioning in the film processing plant and even visits to the toilet were strictly rationed. Anyone who spoke up faced instant dismissal. Fear was the order of the day. Yet, the owners and the swaggering managers didn’t count on the human spirit. It was that true spirit of defiance, of not wanting to see injustice go unchallenged that brought Jayaben Desai and more than 130 other workers out on strike. As even their employers were willing to admit, they were good at their jobs and highly educated. The majority were Asian women – working mothers – who had come to Britain to escape persecution and to seek the chance of a better life. Her courage, and that of her fellow strikers, would be proved again and again over the following months, as TV cameras showed scenes of small, sari clad women being jostled and manhandled by rank-upon-rank of burley, uniformed, policemen. At the beginning of the dispute, none of the workers had belonged to a union. It simply wasn’t permitted or even much thought about. But in their hour of greatest need, the idea of the union – offering solidarity and support – became their biggest hope. They joined APEX (now part of the GMB) and that union showed itself at its very best in providing assistance, full rights from day one, and strike pay, back-dated to the beginning of the walk-out. White and black, Briton and Asian stood together on the picket lines. All those who sought to divide working people one from another were confounded. Never again could it be said that the unions were incapable of organising among immigrant communities, or that those communities did not understand or want to be part of our movement. The grassroots – the backbone of the union movement – was magnificent. As Jack Dromey points out: “A mass movement was underway that led to one of the most remarkable acts of solidarity in Trade Union history”. The trouble was that the Labour Movement and the Labour Party put too much faith in the law, and in procedure. The judgments of ACAS tribunals and the Scarman – government backed - Inquiry all found in favour of the strikers and their right to join a union. But the bosses simply ignored them and the Movement blinked first. Defeat is always bitter, but it is only fatal if we fail to learn the lessons. That is why GMB, in conjunction with Lawrence & Wishart, is keen to sponsor and promote a new edition of the seminal account of the strike, Grunwick – The Workers’ Story. As Tim Roache, the General Secretary of the GMB, says on the 40th anniversary of the dispute: “I am immensely proud of the story of the Grunwick workers. It is not some dry history but a rallying cry, an inspiration and a point of departure. It makes us think – about ourselves and about the type of society in which we would wish to live”. “The strike contained the essence of all that is best in the Labour and Trade Union Movement. For, what we do is not about cynical calculation, it is not about profit and loss, or momentary advantage. It is about decency. A decency that sees the value in every human being, regardless of their background or the colour of their skin. It is a sense of decency that unites us in common cause and fights for universal values. It’s the thing that brings us together, in the trade unions, and keeps us going through the hard times”. Shortly before she died, Jayaben Desai met Jack Dromey one last time. “People will always want their freedom”, she confided. “As we have fought, others will fight. If we have inspired, I will die a happy woman”. Four decades after the beginning of the strike, her words and example are more prescient than ever. John Callow is the Director of Archives at the Marx Memorial Library. He is the author of seven books on history and politics, and is a member of Unite the Union.